Ready to hob nob with some high class doorknobs? These dozen daring twists on a traditionally utilitarian theme will unlock your perceptions of what room decor could and should be. Doorknobs… a most common, everyday appurtenance that’s seen little or no improvement since the age of the ancient Egyptians? Wrong! It wasn’t until December 10th of the year 1878 (AD, not BC) that the US Patent Office approved a patent for the first practical “door holding device”: the complete doorknob as we know it today. Perhaps even more surprising (considering the era) is that the doorknob patent was awarded to an African-American named Osbourn Dorsey. 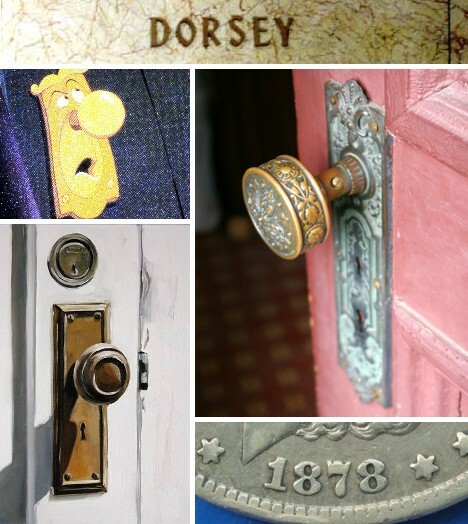 Very little is known about Dorsey other than he had a certain aptitude for door-related devices – he’s also credited with inventing the doorstop. 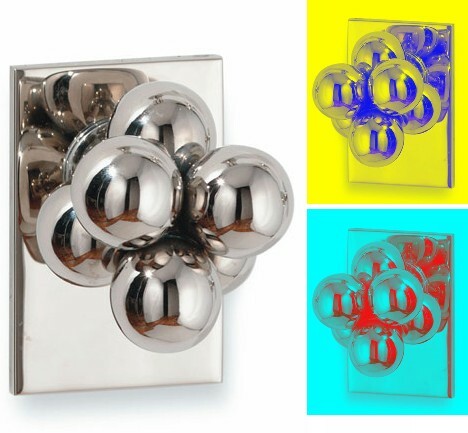 Sherle Wagner‘s Molecular Doorknob was a 2005 design exercise in polished nickel plating that features a half-dozen spherical “atoms” in close association, much like the shape of an actual molecule made by combining individual atoms. The Molecular Doorknob makes one think… about which sphere the user should turn to open the door. 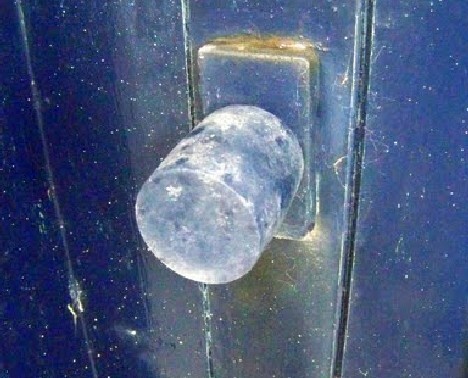 Think doorknobs are the epitome of low-tech? Think again: the Illumi-Knob may even be smarter than you! Well, at least in the middle of the night when you’re stumbling around the bedroom searching for the knob of the bedroom door. You can’t see the knob but the knob senses you, thanks to a futuristic passive infra-red sensor that can detect movement within 10 feet. Once the knob knows you’re coming (how’s that for scary? ), a pair of LED rings softly light up, guiding you to the exit. Each Illumi-Knob holds 3 AAA batteries to power the sensor and its modernistic design acts to turn any standard doorknob into an easy to grasp lever. Look for it in stores by the spring of 2010. There’s not much that can be said about these Ice Cube Doorknobs, other than they look mighty cool with their squared-off design complemented by carved grass hardware. It’s not known for certain whether rapper/actor (raptor?) 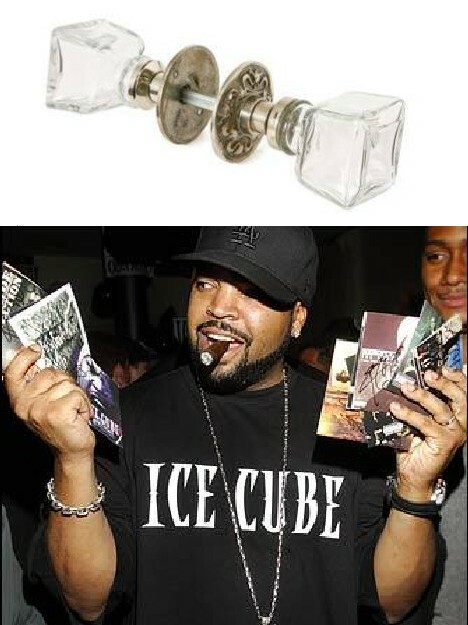 Ice Cube has these, but really, who’s going to walk up and ask him about his doorknobs? 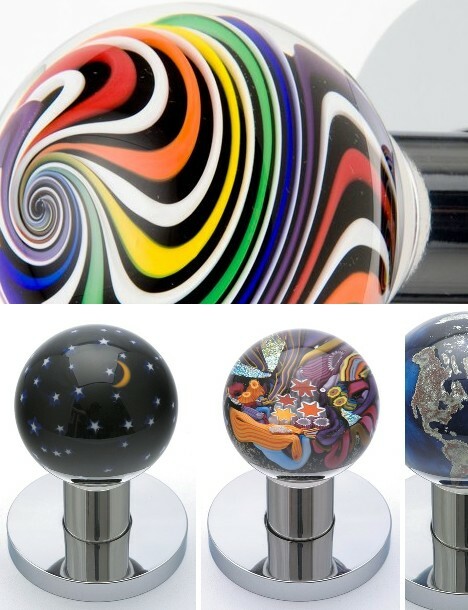 Out Of The Blue Design Studio will knock your socks off with literally dozens of spectacularly beautiful doorknobs crafted with care from exquisite art glass. The available designs range from natural images of leaves, flowers and even a globe, to more abstract themes that serve to focus your attention – and likely the sun’s rays on a bright clear day. These cooler than cool doorknobs look so good you’ll be tempted to forbid people from touching them for fear of leaving fingerprints. 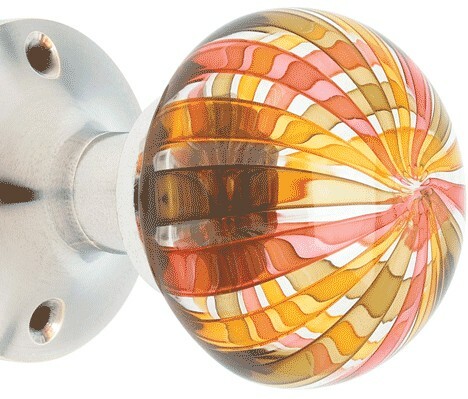 Tracy Glover melds artistic sensibility with everyday practicality in an ethereal series of hand blown glass doorknobs. One may wonder if designing a high-traffic object like a doorknob in possibly fragile blown glass is really a good idea. 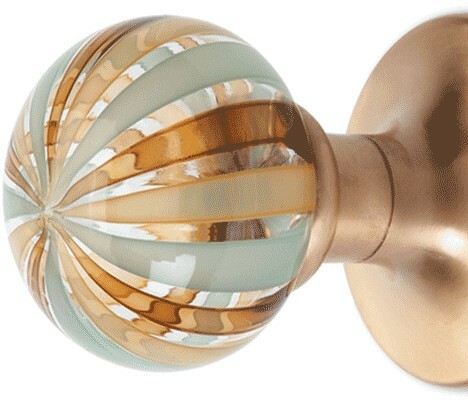 The beauty of Glover’s doorknobs speaks for itself – but the bathroom door might not be the best place to install them. 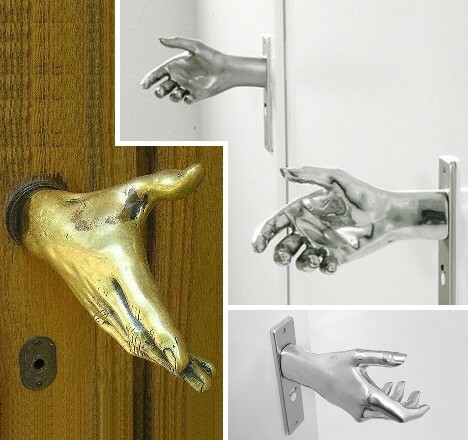 The art of the doorknob? Why not – doorknobs present an almost cameo-like circular surface that many 19th century artists and decorators have found perfectly amenable to the styles of the times. 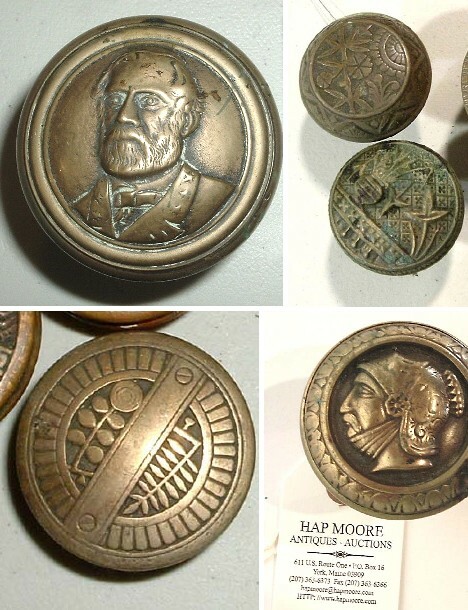 Though old-fashioned doorknob art has fallen from grace, collectors have acted to preserve this unique art form by saving, trading and auctioning the best examples of the genre. Cold, hard stone, ground down from immense rocky boulders by mammoth sheets of ice a mile or more thick… then outfitted with brass hardware and installed on your door. 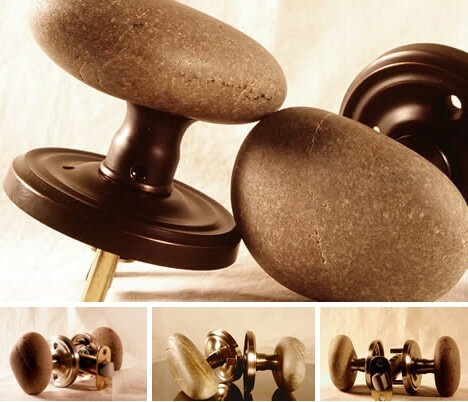 If the thought of grasping nature’s bounty worn smooth by the action of wind, water and ice over thousands of years sounds appealing – and indeed it does – these roughly matched sets of glacial stone doorknobs from Skipping Stones are exactly what you’ve been looking for. Imagine you’re at a stranger’s house for the first time and as chance would have it, nature called… following the instructions to head “down the hall, second door on the right”, you arrive at the portal in question and are greeted – literally – by a handshake doorknob. Various thoughts may then come to mind, especially “I shouldn’t have had that last beer.” It could be worse: the handshake doorknob could be on the INSIDE of the bathroom instead of on the outside. 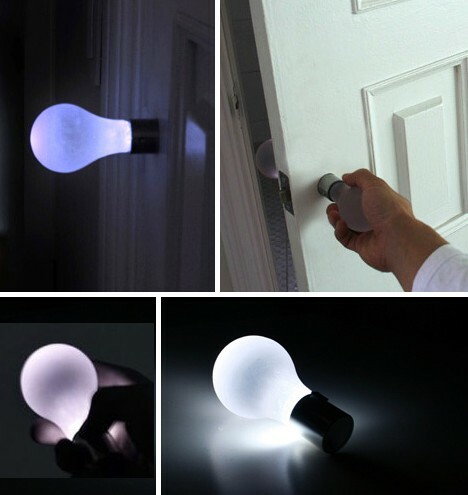 It had to happen at some point: somebody notices the similarity of doorknobs and light bulbs, then designs The Knob Light, a doorknob that looks like – and acts like – a light bulb. The somebody who did this deed is South Korea’s Jeong-Sun Park. Rumors are the runner-up was an 8-year-old kid named Kevin who, being home alone and with nothing much else to do, tried the same thing using an actual 100-watt light bulb that was always on. Dumb as a doorknob? 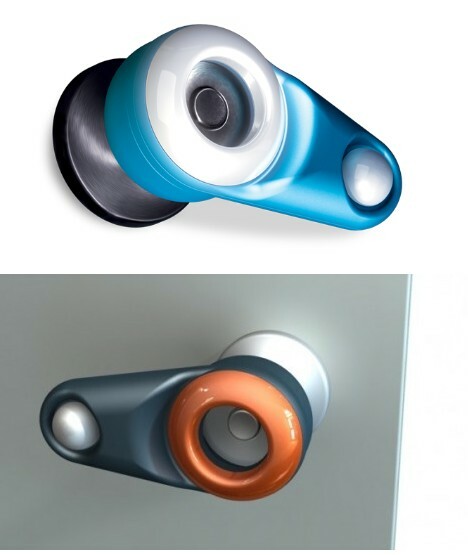 Not THIS doorknob, called The Doorknob Condition by its designer, Arnaud Lapierre. An innovative pulley mechanism retracts the outside doorknob to be flush with the door’s facing, thus foiling any uninvited “guests” who attempt to enter. The raw earthiness of the above image – and the doorknob which it depicts – are evocative of a time in the distant past before industrialization standardized utilitarian devices like doorknobs. This one, located somewhere in Scotland, looks as if it was laboriously hand-carved by the same forgotten ancients who built Stonehenge… and probably from the same type of stone. 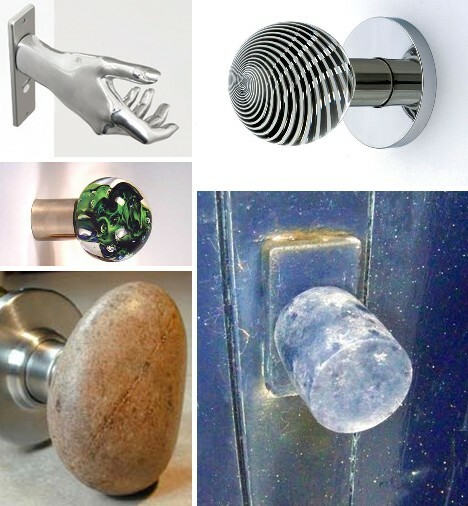 Doorknobs have taken their knocks, being as they have often been the doormats of home design – no offense to doormats. Hopefully this entry will be the key that opens the door to the many ways doorknobs can turn the mundane into the magnificent.